Aceh Tamiang Regency is a regency (Indonesian: kabupaten) in the Aceh province of Indonesia. It is located on the island of Sumatra. The regency covers an area of 1,939 square kilometres and according to the 2000 census had a population of 234,611 people.The seat of the regency government is at Karang Baru. Central Sumba Regency (Indonesian: Kabupaten Sumba Tengah) is a regency in East Nusa Tenggara of Indonesia. The new Central Sumba Regency was established when West Sumba Regency was split into two regencies in 2007 and a further Regency was created in Central Sumba from parts of both West Sumba and East Sumba. The seat (capital) of its government is located at Waibakul. Dompu Regency is a regency (Indonesian: Kabupaten) of the Indonesian Province of West Nusa Tenggara. It is located on the island of Sumbawa and the capital is Dompu. It is bordered to the north and to the east by two non-contiguous parts of Bima Regency, as well as by Saleh Bay, Sanggar Bay, and Cempi Bay. It covers an area of 2,321.55 km2, and the population at the 2010 Census was 218,984; the latest official estimate (as at January 2014) is 228,811. Jogorogo is a district (kecamatan) in Ngawi Regency, East Java Province, Indonesia. Kedu Residency (also known as Kedoe and Kedoo) was a colonial administrative unit in Central Java in Java, Indonesia. It contained the areas which are now the Kebumen, Wonosobo, Temanggung, Purworejo and Magelang regencies (including Magelang city). All of the areas under the residency is under the Surakarta Sunanate, until the Indonesian government abolished its recognition of the monarchy. It was adjacent to the Banyumas (to the west), and Semarang (to the north) residencies. The town of Malinau is one of the subdistricts of Malinau Regency in North Kalimantan Province of Indonesia and is also the administrative capital of the Regency.Malinau town has the highest population density within Malinau Regency, at 154.90 people / km ², in an area of only 123.09 km ².
Mantingan is a district (kecamatan) in Ngawi Regency, East Java Province, Indonesia. Nagan Raya Regency is a regency (Indonesian: kabupaten) in the Aceh special region of Indonesia. It is located on the island of Sumatra. The seat of the regency government is at Suka Makmue. The regency covers an area of 3,363.72 square kilometres and according to the 2010 census had a population of 139,663 people; the latest official estimate (as at 2014) is 147,037. 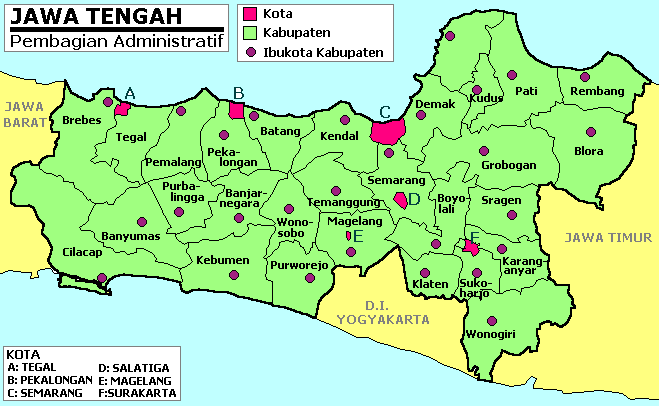 Regencies of Bali in Indonesia (known in Indonesian as Kabupaten) are administrative divisions. The administrative capital is Denpasar. Soppeng Regency is a regency in South Sulawesi province of Indonesia. Soppeng Regency has its seat of government (capital) in Watansoppeng, located 180 km from Makassar. It covers an area of 1,359.44 km2., and had a population of 223,757 at the 2010 Census. Southeast Sulawesi (Indonesian: Sulawesi Tenggara, abbreviation: Sultra) is a province on the island of Sulawesi, forming the southeastern peninsula of that island, together with a number of large offshore islands such as Buton, Muna, Kabaena and Wawonii, with smaller islands. The capital is Kendari, on the east coast of the peninsula. The province has no highway road connecting to the rest of the island, and the primary transportation link is a ferry across the Bone Gulf between Watampone (Bone) in South Sulawesi and the port of Kolaka in Southeast Sulawesi. Southwest Aceh Regency (Indonesian: Kabupaten Aceh Barat Daya) is a regency in the Aceh special region of Indonesia. It is located on the island of Sumatra. The regency covers an area of 1,490.6 square kilometres and according to the 2010 census had a population of 126,036; the latest official estimate (as at 2014) is 132,690. The seat of the regency government is at Blangpidie. Subulussalam is a city (Indonesian: kota) in Aceh province of Indonesia. It is located on the island of Sumatra. Since 2 January 2007, the provincial government of Aceh declared Subussalam as city as a result of the administration expansion from Aceh Singkil Regency. It is located at 2°38′32″N 98°00′15″E. As of 2010, the population was 67,316. and has an area of 1206 square kilometres. Sumbawa Regency (Indonesian: Kabupaten Sumbawa) is a Regency (Kabupaten) of the Indonesian Province of West Nusa Tenggara. It is located on the island of Sumbawa and covers an area of 6,643.98 km2. It includes the substantial island of Moyo, lying off the north coast of Sumbawa. The population of the Regency at the 2010 Census was 415,363, but the latest official estimate (as at January 2014) is 434,469. The capital is Sumbawa Besar. Taliwang (Indonesia: Kota Taliwang) is the capital city of the West Sumbawa Regency, on the western coast of the island of Sumbawa. It is the fifth largest town on the island of Sumbawa, with a population of 44,136 at the 2010 Census. Tana Toraja Regency (Indonesian for Torajaland or Land of the Toraja, abbreviated Tator) is a regency (kabupaten) of South Sulawesi Province of Indonesia, and home to the Toraja ethnic group. The local government seat is in Makale, while the center of Toraja culture is in Rantepao. But now, Tana Toraja has been divided to two regencies that consist of Tana Toraja with its capital at Makale and North toraja with its capital at Rantepao. The Tana Toraja boundary was determined by the Dutch East Indies government in 1909. In 1926, Tana Toraja was under the administration of Bugis state, Luwu. The regentschap (or regency) status was given on 8 October 1946, the last regency given by the Dutch. Since 1984, Tana Toraja has been named as the second tourist destination after Bali by the Ministry of Tourism, Indonesia. Since then, hundreds of thousands of foreign visitors have visited this regency. In addition, numerous Western anthropologists have come to Tana Toraja to study the indigenous culture and people of Toraja. Watansoppeng is a town in South Sulawesi province of Indonesia and it is the capital of Soppeng Regency. This town is also popular as Kota Kalong, which means megabat city. About 12,500 black Flying-foxes overhang on trees in city.Charley Boorman visited Watansoppeng in 2009 as part of By Any Means 2. West Sumbawa Regency (Indonesian: Kabupaten Sumbawa Barat) is a Regency (Kabupaten) of the Indonesian Province of West Nusa Tenggara. It is located on the island of Sumbawa and has an area of 1,636.95 km2. The population at the 2010 Census was 114,754, but the latest official estimate (as at January 2014) is 120,115. The capital is Taliwang. Poto Tano, the most important harbour of West Sumbawa, is easily accessible by ferry from Lombok.